From a small room in the Scottish Borders, Graham Stoddart is using the hand press he designed and made to create Cuddybridge Apple Juice, as John Cook discovers. Like many artisan food producers in Scotland, Graham Stoddart has found a small but fruitful niche. When he’s not traversing the local Peeblesshire countryside as a postie, his life is all about apples or, more speciﬁcally, apple juice. From a small room on the High Street in Innerleithen, his Cuddybridge Apple Juice is ﬂowing (and ﬁnding its way on to tables at some of the top restaurants in Scotland). The process is simple and the product pure. After the whole apples are crushed, the result goes into the press that he designed and built. Then down goes the pressing disc and out ﬂows the juice. A hundred and ﬁfty apples per press produces just under 20 litres of juice; each 330ml bottle of the finished product contains the juice of about four apples, depending on their size. The addition of a tiny amount of ascorbic acid and a brief pasteurisation process are the ﬁnal touches to ensure that the juice has a decent shelf life. Finally, the ‘pomace’ of pulp that is left over is snufﬂed up by local rare-breed pigs. Stoddart certainly knows his local apples. As a trained horticulturalist specialising in soft and top fruit, he has a considerable track record planting and maintaining large orchards for local landowners. Certainly, the rich farmlands around Innerleithen and nearby Borders towns have made their mark on the wider apple world. Apple varieties such as Stobo Castle, White Melrose and James Grieve date from a Victorian period when the record density of nearly 70 walled gardens in the Borders were a veritable hothouse of horticultural innovation. 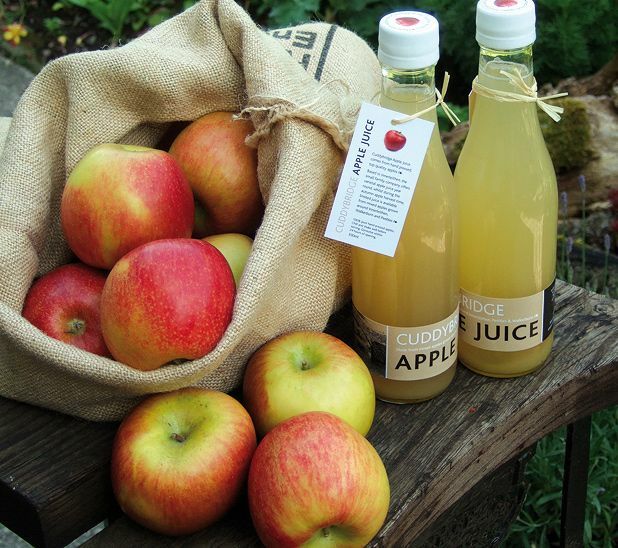 Stoddart is an enthusiastic expert teacher at apple and orchard events, from the Botanics in Edinburgh to Tyninghame House near East Linton, making juice and spreading his passion for an indigenous fruit that has a long history in Scotland and is undergoing a bit of a revival.